2016 CG Players Cards Now On Sale! ABOVE PAR PGA TOUR stars and other NW celebs rank their favorite Washington par-3s. they are our friends. Their local, family-owned business is one of the oldest in the U.S. golf retail industry. We embrace their vision and parallel their commitment to customer service. The Puetz and Cascade Golfer teams are fully committed to this game and the people we are fortunate to serve. And, of course, there is NO magazine without you guys — our readers. We hear from hundreds of you every month. We see you at our tournaments and on our social media channels. You are the inspiration, focus and fuel that powers the magazine and all the pieces under the flag we fly each day. In my almost 30 years in the Northwest golf scene, I have personally helped launch and publish four golf magazines: Pacific Northwest Golfer, for the PNGA in 1994; Northwest Golf (1990); Destination Golfer (2009); and of course, Cascade Golfer. Each was unique and I am grateful to be a part of those title’s histories. Starting a magazine from scratch is like raising a child. You aren’t quite sure of the journey ahead, but you love it, nurture it and try to make good decisions as you learn and grow. I have enjoyed the evolution of the Cascade Golfer, and can’t wait to see what lies ahead. With a new spring comes new golfing experiences and opportunity. Keep your comments and needs coming – we want to deliver. Enjoy another great issue and, as always, TAKE IT EASY. Log on to CascadeGolfer.com for your chance to win! And don’t forget to follow us on Facebook (Cascade Golfer) and Twitter (@CascadeGolfer) for even more giveaways and contests! Duke’s Announces First Jr. Scholarship Winner, Expands Total Winners to Four! WANT TO SEE YOUR YOUNG GOLFER IN THE NEXT CG? Send an email to editor@cascadegolfer.com with the subject line “Duke’s Junior Golf Scholarship” and let us know why your young golfer deserves $1,000 from Duke’s Chowder House! young players significant national exposure. “This tour prepared me for college golf,” says Chip Hoch, a current professional who competed in HJGA events for years before playing collegiately at Florida Atlantic. “The course setup, quality of the events, and strength of competition have helped me become a better player. I owe a lot of my recent success to the HJGT.” To learn more, visit www.hjgt.org or call 904-379-2697. Chambers Bay • University Place, Wash. Chambers Bay, Gamble Sands, Salish Cliffs Headline 2016 CG Cup Compete with friends and family to win over $100,000 in prizes at Washington’s top courses! APRIL 16 — Chambers Bay MAY 14 — Washington National JUNE 4 — Salish Cliffs JUNE 25 — Oakbrook G.C. JULY 23 — McCormick Woods AUGUST 13 — Gamble Sands SEPTEMBER 10 — White Horse See CascadeGolfer.com/Cup for details! n 2012, the first-ever Cascade Golfer Players Card featured five rounds of golf, for $129. How quaint. This year’s card — our biggest and, without question, our best yet — comes loaded with 10 rounds, including some of the top courses in the state. Want to play Salish Cliffs, the course ranked No. 5 in the state last year by CG’s voting panel? Boom. How about Apple Tree, whose signature par-3 17th hole is only one of the most photographed in the world? Boom. What about Whidbey Golf Club, which only recently began allowing public golfers to cross the velvet rope? Boom. Play all three of those courses this year, on your own, and you’ll spend $225. Green fees add up quick, yo. Spend just $15 more on the card, however, and you’ll get all three, plus seven additional rounds — at Eaglemont, Port Ludlow, Highlander, Cedars at Dungeness, Leavenworth, Mount Si and Snoqualmie Falls. and British Open that we’ve given away in our CG Cup tournaments. But that’s just the Cascade Golfer way — we want to get you out there playing as much golf, at as fair a price, on the best golf courses, that we can. We started with just 200 cards, and over 70 percent are already gone — so act fast, either by going to CascadeGolfer.com or emailing simon@cascadegolfer.com. When you walk into a prop shop this summer, you can either be the golfer who pulls out your credit card, or the one who pulls out your Players Card — and with nearly $350 in savings built-in, we certainly know who will look smarter. here’s nothing quite like the rush of match play. Especially for golfers prone to blow-up holes, it’s a relief knowing that the triple-bogey you posted on the first hole won’t hang over your entire round — beat your opponent at hole No. 2, and you’re right back to all square. And it’s one of the most compelling formats to watch on TV, whether at the Ryder Cup or the WGC Match Play Championships each spring, not only for the hole-to-hole drama, but for the way it shows you how certain players handle the pressure of the format. Some, like Ian Poulter, shine; others, like Jim Furyk, crumble. Ever wondered how you would fare in a legit, tournament-style match play championship? So did we. That’s why we’ve given more than 200 golfers in the last two years the chance to find out, with the Cascade Golfer Match Play Championship. The Northwest’s biggest amateur match play event, the CG Match Play Championship sees as many as 256 golfers tee it up in head-to-head match-play battles at courses throughout the Pacific Northwest all summer long. The tournament is open to any player with an established handicap (all handicaps will be carefully vetted), and golfers are grouped into pods based (as best as possible) on location and skill level, then schedule their own matches at mutually agreed-upon courses. Win a couple of matches, and you’ll take home a prize — plus another for every match you win thereafter, including rounds of golf and more, with the prize value increasing for each subsequent round. At the end of the summer, the eight quarterfinalists will be treated to as many as three rounds on the house at Salish Cliffs Golf Club, including the quarters, semis and final round, all played over 30 whirlwind hours at one of the top tracks in the state. Make it to the semis, and we’ll even kick in an overnight stay at the Little Creek Casino Resort ... all for free! Past champions and finalists have included scratch golfers and bogey golfers, so simply play your best, and you could be the one holding the trophy at Salish Cliffs! Tournament entry is just $85, and includes your entry fee and, should you qualify, all rounds of golf from the quarterfinal round through the finals. Furthermore, every single player that enters will receive a 2-for-1 round at Salish Cliffs and a one-year subscription to Golf Digest. In other words, enter the tournament, and stink up your firstround match, and you’ll still break even on your entry fee. Make it all the way to the finals, and in addition to that thrilling weekend at Salish Cliffs — a package valued at $470 — the Cascade Golfer Match Play champion will take home a stay-and-play package to Las Vegas, while the runner-up will console themselves with a sweet prize of their own. For any golfer who hasn’t experienced the thrill of match play, and for those who know it all too well, the Cascade Golfer Match Play Championship is a ride you won’t want to miss. Register at CGMatchPlay.com, or contact Simon Dubiel at simon@cascadegolfer.com to learn more! THE ROAD TO SALISH CLIFFS Matches played locally at the golf course of your choice. •	Net-based matches. •	Open to all golfers with an active handicap. •	256 golfers from Oregon and Washington compete in pods and regions, bracket-style. •	Starting in May, participants have 4 weeks to play their match in each round, at a time and venue agreed upon with their opponent. •	The Final Eight will be played Sept. 30-Oct.1 at Salish Cliffs Golf Club. Green fees for all matches from the Final Eight on will be comped for all players. •	All golfers get a 2-for-1 to Salish Cliffs. •	Top 32 prize out. Prizes improve with each match won. •	Overall champion receives a golf package to Las Vegas. wo years ago, we found ourselves hunting through our daily emails from various deals sites, scrolling past the restaurant discounts, skydiving trips, massages, airport parking, auto detailing and other bric-a-brac for the only kind of deals we cared about — golf. They’d pop up now and then, but they were few and far between — and usually to some out-of-the-way (and not particularly great) track that, even at 50-percent off, wasn’t all that much of a bargain. So, we did the same thing we always do at Cascade Golfer when we can’t find exactly what we want — we made our own. Our new deals site, CascadeGolferDeals.com, debuted last spring with offers to courses we actually want to play — places like Port Ludlow Resort, Suncadia, Apple Tree, McCormick Woods, Oakbrook, Moses Pointe and others. Our first-ever offer — all-day play for two at Port Ludlow, including carts, for just $89 — flew off the shelves, as did follow-ups like 36 holes at Moses Pointe (for two players) for $121, 36 holes for two at Suncadia for just $118.50 per player, half-off on lessons at Puetz, and more. In all, we sent more than 1,000 local golfers off to play top-tier courses in 2015 for as much as 60-percent off the greens fee — add up all of the savings, in fact, and golfers were able to keep more than $40,000 in their pockets last year using CascadeGolferDeals.com, while playing more golf than they might have without our offers. As a magazine whose mission is to bring you “news and views you can use,” and help you stretch your golf dollar as far as you can, it’s been a beautiful sight to behold. And it’s not going anywhere soon — as you read this, our staff are hard at work locking down deals for the coming golf season to rival, or even exceed, the ones we managed to put out there in 2015. Start saving on your golf rounds today! Visit the site at CascadeGolferDeals.com and click the “Sign Up” link to begin receiving our weekly emails. You’ll be glad you did. Suncadia Resort was one of dozens of courses offering golfers 40-60 percent off the full-price greens fee last year through CascadeGolferDeals.com. Get your next round here! Hole No. 12 Par 4 314 yards (Blues) The Setup: Rope Rider recently reversed their nines, so the former third hole now plays as the 12th hole of your day. Although 314 yards may not be reachable for many, the fairway runs downhill for the last 100 yards or so before the green, and gives any well-struck tee shot a real chance to roll onto the putting surface. That is, of course, if you avoid the front bunker and don’t roll through the green and into the bunkers back left or right. right you hit it, the closer the junk comes into play, and the more lost your ball is. Have fun with that. Hopefully you played holes 10 and 11 well, because you just gave it all back with one swing. The easy play is to pop a 5-iron down the fairway and hit wedge in. Pay attention to the pin placement, as you will want to miss in the right spot. the green is one of the deeper ones on the course. And, once you get past No. 12, the following six closing holes at RR are not a walk in the park, so make your money while you can. letic scholarships and a No. 1-ranked program to pursue their dreams in a field where working just as hard as your male counterparts is worth less than 20 percent of the salary, and being the 100th-best person in the world at your job just barely covers your expenses ... well, let’s just say it takes a lot of guts, and a strong belief in yourself and your abilities. he decision to turn pro wasn’t an entirely surprising one in either case — Kim was always destined for the LPGA, either at the end of her four-year career, or sooner, while Yan had won multiple elite amateur championships as a junior golfer, and even made the cut in two professional events. Kim, 22, immigrated to British Columbia from South Korea as a young girl. Immediately upon arriving at UW, it was clear Kim was special — she finished second in her first collegiate tournament, and her five top-10s were, at the time, the seventh-most in a season for any Husky women’s golfer. By the spring of her sophomore year, she was America’s top-ranked collegiate golfer; by that fateful December day in the middle of her senior year, she had set UW career records for wins and scoring average, and was a two-time WCGA All-American. Yan, meanwhile, came to UW from Shanghai, China, having won the 2013 Girls British Open Amateur Championship and the Ladies British Open Amateur Stroke Play Championship, and having made two LPGA cuts as an amateur player. In her two appearances with the Huskies, she had already earned her first win. During the three-month winter break in the collegiate season, however, both players opted to participate in the LPGA’s Q School in Daytona Beach, Fla. Kim tied for 11th, earning full status for 2015 — if she wanted it — while Yan placed 34th, good enough for conditional status. The timing of the LPGA’s Q School poses what many from the college perspective believe is an unfair choice for the women who qualify. All of them must decide — at that moment — between potential college success or professional riches. There’s no waiting, debating or pondering. It’s an intractable divide between the LPGA and the NCAA that creates a situation where no one really wins. “The timing couldn’t be worse,’’ says Mary Lou Mulflur, now in her 33rd season as the UW golf coach. “Virtually all of the players say yes, because of the degree of difficulty it takes to be among the top qualifiers. That means college teams who have just lost their best player(s) have to scramble. At that point in the season, it’s not like they can recruit and recover. They have what they have. It would be like the NFL holding its college scouting combine in December and requiring players to immediately declare as professionals before bowl games or the College Football Playoff.” Yes, or no. Go pro, or stay amateur? Players must decide right then — as Mulflur notes, “They can’t defer their status to start (the Tour) in June.” Both Kim and Yan said yes. Win Two Passes to the KPMG Women’s PGA Championship! he U.S. Open was fun, but we’re looking forward to a major where we can actually see the competitors as they play — or even follow them for a full 18 holes! If you’re like us and you’re excited to see Michelle Wie, Lydia Ko, Natalie Gulbis and the top women’s golfers from around the world compete for a major championship on one of our most celebrated (not to mention exclusive) tracks, log on to CascadeGolfer.com and enter for your chance to win two tickets to the 2016 KPMG LPGA Championship at Sahalee this June! 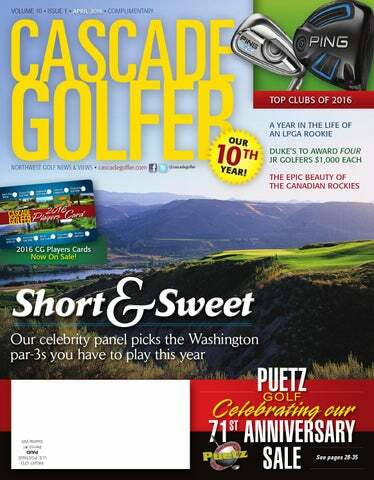 Brian Beaky is the editor of Cascade Golfer. Bob Sherwin is a longtime Seattle sportswriter and co-founder of GolfersWest.com, who writes regularly for Cascade Golfer, The New York Times, the Associated Press and MLB.com. “There’s just something redeeming when you conquer a cliff,” Huard says. No kidding — and there’s no cliff quite like the one at No. 9, where the whole world appears to drop off below your feet. While the tees can be placed almost anywhere along a 100-yard strip from about 130-230 yards out, most golfers play it between 170-200 yards — though the steep drop-off and the wind that blows in off the Sound in the afternoon can wreak havoc with your club selection. Pin placement is key — if it’s to the right, you can loft a shot to the center of the green or even off the back slope, where Jason Day had his famous fall, and let it run down to the front-right corner. Go too high on the slope, though, and you’ll either lose it in the junk, or watch it run too far across the green and wind up in a deadly front bunker. If the pin is front-left, a knock-down shot to the apron will run right up to the hole, or run a little ways up the back slope before settling down. Take a picture and soak it all in, because birdie or bogey, it’s one you’ll remember. This is one course Ryan Moore knows like the back of his hand. The son of Classic owner Mike Moore, Ryan honed his game among The Classic’s towering pines — a game that has carried him to four PGA TOUR wins and a consistent top-50 world ranking. So it’s no surprise that he’d pick a hole from his home course, and of The Classic’s par3s, none leaves a more lasting memory than No. 8. From an elevated tee box anywhere from 100-150 yards from the hole, golfers play across water for the only time during their round, to a well-guarded green. As Ryan notes, there’s no truly safe play — other than a good shot: “No. 8 is a great, short-to-mid-range par-3. A pond guards the front, but if you try to play safely long of a front pin, the bunkers behind leave a scary next shot.” Short, scary sweet — and loads of fun. Yes, Chambers Bay has two holes on this list. And you know what? They might not even be the best two par-3s at the course. The third hole, with its Redan-style green just begging you to miss right, is a dream for slicers everywhere, while the 17th and its seemingly never-ending green is one of the most photographed holes on the course. While our former NFL quarterback preferred lobbing bombs into the green at No. 9, our former Supersonic favors the sublime beauty of Lone Fir, where the best strategy is usually to aim for the backboard, and let your shot fall down to the rim ... of the cup. If you can avoid the pot bunker to the left, the sand on three sides, and the distracting beauty of the sun glistening off the Sound behind Lone Fir itself, it’s usually not too tough of a par — or better. And the only thing sweeter than the sound of a basketball swishing through the net, is your birdie putt dropping into the bottom of the cup. We could tell you all about the third at Salish Cliffs — how, played into the wind from its 211-yard Players tees, we often pull the same club we use on the tee of the 250-yard, par-4 second hole just below it, which plays the opposite direction. Instead, we’ll let one of our favorite local pros, Lakewood’s Andres Gonzales, speak for himself: “My favorite par-3 for a public track is the third at Salish Cliffs. It’s a downhill par-3 that makes the hole play shorter than it really is. There is a catch — from the championship tees, it is 291 yards. There is nothing too tricky about the hole except the fescue lining both sides. There’s a bunker protecting the left side of the green as well, preventing wayward balls from bouncing hard left into oblivion. The hole can be played as short as 180, but length is the main challenge golfers face in this exceptional par-3.” Exceptional is the right word — both for its length, its beauty, and its sheer enjoyment. “The sixth at Gamble Sands is awesome. Aim right, over the hill, and watch your ball disappear for a minute before coming back into view as it rolls onto the green, headed straight for a middle pin.” — Kirk Schwarl “Apple Tree, No. 17. Not only is the view from the tee box amazing, but it’s also equally challenging. It’s all carry, with just the tiniest bit of life in the form of a small, leaf-shaped sand trap off the back if you go long.” — Jason Meadows “No. 9 at Highlander. There’s few more pressure-packed shots in the state, with a chasm between you and the green, and that sign warning you not to pursue lost balls at risk of death.” — Kelly Sanders Join the conversation with fellow CG readers on Facebook (Cascade Golfer) and Twitter (@cascadegolfer)! “Sixteen is really, really tough,” says Mackenzie, who should know — as an All-American golfer at Washington before launching her LPGA TOUR career, she’s played it plenty of times in competition. “It kicks off a perfect finishing stretch for a golf course — hard par-3, hard par-5, then you get to 18 and you get to take it easy, with the widest fairway on the golf course,” she says. “That’s how I like to finish a round.” Sixteen may not look like much on the scorecard, at just 146 yards from the blue tees — but until you’ve found yourself hunting for your ball among the rocks that line the creek running down the right side, or hacking out of one of the steeply faced bunkers, you can’t entirely appreciate its challenge. The backto-front slope of the green, too, makes staying below the pin key to any serious birdie attempt — an extra-challenging task when coming in with a long iron from the 198-yard tips. And of course, there’s always the looming vision of 17 — one of the state’s most bedeviling holes — in the background. Compared to many of the names on this list, you’re probably not all that familiar with Rob Perry. But if you’ve read a golf magazine, or walked into a pro shop, or visited a golf course website in this state at any time in the last 20 years, you’ve almost certainly enjoyed a Rob Perry photograph. The state’s pre-eminent golf course photographer, Perry’s shots are ubiquitous in the Washington golf scene — if you’ve ever seen a photo of a local course, and thought, “Wow, that’s a great shot,” odds are good it was a Rob Perry. So, we naturally included the man with the golden eye on our panel (even if he prefers to stay behind the camera, hence the lack of a headshot above), knowing he’d pick a beauty — and did he ever. Seemingly all of Gold Mountain’s par-3s could make the list, but none are prettier than 16, which usually plays about 150 yards, entirely over a water to a green backdropped by lodgepole pine. Provided you get it there, it’s not a particularly tough par, which makes the scenery all the more memorable. That image you have in your mind? Credit Rob Perry. BY JIM STREET course, with a projected re-opening in 2017.) The legendary Thompson is to Canada golf design what Robert Trent Jones, Sr., is to America. Thompson designed more than 200 courses during his epic career, most of them in his native country. Banff Springs and Jasper Park were constructed with horses, wagons, picks and shovels in the 1920s, yet are so good to this day that both are continuously ranked among the top-10 courses in the country. And with the U.S. dollar worth 20 percent more than the Canadian buck, now is a good time to visit our northern neighbors. The golf is great and the scenery is even better. “Our objective is to have people from the (United) States look a little farther north,” says Gordon Schultz, President at Golf Canada’s West Ltd. “We can send pictures, but until you see it, you don’t know. Almost to a person, the reaction has been, ‘I had no idea.’” I’ll admit it — I had no idea that what I was about to experience was destination golf at its best. pre-round briefing at Silvertip Resort stressed the importance of being aware at all times — because we were in bear country. “If you encounter a grizzly bear, stop and evaluate the situation,” I was told. “Identify yourself by speaking in a calm, appeasing tone. Back away slowly, preferably in the direction you came. Walk, don’t run, and keep your eye on the bear so you can see how it will react.” Gulp! “If you encounter a black bear, hit it with rocks, pots, pans, sticks or fists – anything handy. The odds may seem against you in a fight, but bears generally do not see humans as prey, and a bear that makes a predatory attack is usually immature, starving or wounded, and may easily be scared away if you hit it.” Double gulp! My choice would have been the 4-rescue club, with emphasis on “rescue.” But, I didn’t encounter either kind of bear on the course, which offered plenty of its own beauty and challenge. My two favorites were No. 15, a 145-yard, par-3 over water looking directly at multi-million dollar homes and a section of the Canadian Rockies, and No. 18, a 415-yard, par-4 with a 600-foot elevation drop from tee to green. If you like elevated tees, this is the place to go. It feels like you’re standing on top of the world on nine different tee boxes at Silvertip. Continuing the theme, I capped my round with a 12-minute excursion aboard a chopper from Alpine Helicopters, including closer views of the Three Sisters (Faith, Hope and Charity), before dinner (a delicious Elk burger) at Tavern 1883 and visits to a couple of local watering holes. able,” she said. After a night’s rest at the Fairmont Jasper Park’s Milligan House, an eight-bedroom, eight-bath log cabin with an expansive meeting room in the middle, I made the short walk over to the resort’s renowned golf course for one of the most pleasant rounds of golf imaginable. By the fourth hole, I couldn’t help but wonder how in the world Stanley Thompson pulled this whole thing off. Without any heavy machinery, fifty teams of horses and 200 men turned an area of rock and trees into a gem of a golf course that has stood the test of time. Trains hauled in loads of topsoil to spread over the rocky soil, ensuring that the course would drain well to this day. Nearly 100 years later, the Jasper still ranks among the top five golf courses in Canada – and is No. 1 on several lists. The Jasper course underwent some alterations during its first 70 years, but in 1994, course staff used Thompson’s original blueprints to help restore the course to its original layout. Bunkers and tee boxes received special attention, with many of the tee boxes now incorporating boulders that were unearthed during the restoration. Clouds obscured portions of the mountains, but our “four seasons” round was superb. It rained on us a few times and hailed on No. 8, but the sun eventually came out and the clouds lifted enough in the late morning for us to get a good glimpse of the peaks that rise more than 10,000 feet, adding to the overall beauty of the 6,663yard, par-71 course. The featured hole is No. 14, a 355yard, par-4 over the edge of a lake. mont Banff Springs Hotel, also known as the “Castle in the Rockies.” Virtually every hole on the 18-hole, 6,938 yard, par-71 course has its own personality – none more so than No. 4, a slight downhill, 165-yard, par-3. “Devil’s Cauldron” is so well-regarded, in fact, that it was once selected as one of the top 18 holes in the world. My final round of the week came at the semi-private Canmore Golf & Curling Club, which, in addition to being the least flashy of the courses I played, was also the only one with a price tag under $100. Schultz summed it up the best, noting that “Canmore is sort of like going to Cheers, where everybody knows your name.” The club boasts more than 600 members — no surprise in one of the world’s most outdoor-active communities. (Nearly one-third of the city’s 15,000 residents have a membership at the nearby Elevation Place, a 77,000-square-foot facility that includes, among other things, an eight-lane swimming pool and 60-station rock-climbing structure.) Despite the high number of regular members, leading to about 34,000 rounds per year, 90 minutes of tee times are set aside each day for the public, who must remain focused on the narrow fairways, as opposed to the top-notch views. As my scorecard would attest, it’s a challenge easier said than done. s my flight lifted off the following morning, I reflected on the week — six days in some of the continent’s most beautiful country, playing incredible courses, dining on steaks and unique local fare, and holing up at some of the most luxurious resorts in all of Canada. Schulz had suggested at the start of the week that I “had no idea,” and he had certainly been proven right. Now, I do — and so do you. Jim Street spent 30 years covering major-league baseball in Oakland and Seattle. He now lives in the Seattle area and works as a freelance journalist, and is the co-publisher of the sports website, GolfersWest.com. Rockaway Bar & Grill Remember, we’re only 15 minutes from I-5 exit #212, in the “Sun Belt” on Camano Island. o sports fans, seeing the state of Alabama and the phrase “top-10” in the same sentence is no surprise. The state’s college football powerhouses, the University of Alabama and Auburn University, are among the winningest programs in the sport’s history, and have combined for 17 national titles. (Though, as Alabama fans would be quick to point out, that’s 15 for the Crimson Tide, and just two for the Tigers. Roll, Tide.) In recent years, though, Alabama has begun popping up on a different top-10 list — America’s top-10 golf destinations. Carried in large part by the Robert Trent Jones Golf Trail, a collection of 26 courses scattered across the state designed by the legendary RTJ Sr., along with rates that haven’t quite yet caught up to the state’s “premier golf destination” reputation, Alabama is quickly becoming a go-to spot for golfers seeking an alternative to the well-traveled paths to Palm Springs or Florida. Need more reasons to set course for the Yellowhammer State this year? No problem — we have plenty. By Brian Beaky CG Editor abama to design 26 courses in all corners of the state, essentially creating a golf destination from scratch. Bronner’s board members must all have been golfers — it’s the only way to explain this crazy idea becoming reality. Even crazier? It worked — the Robert Trent Jones Golf Trail has become renowned throughout the country for its unique courses, beautiful layouts and reasonable rates. The New York Times called it “some of the best public golf on Earth,” while The Wall Street Journal called it America’s best golf bargain. And it’s true — despite several top-100 tracks, rates at most of the RTJ Trail courses top out between $50-$85 for 18 holes. welcomes thousands of visitors each year, and occasionally takes a starring turn in Hollywood movies. Visitors can tour the decks and gun turrets, and even see the bunk where Major League Baseball Hall of Famer Bob Feller resided from 1943-45, when he served as a Gun Captain and Chief Petty Officer. In addition, the battleship is part of a large memorial park, including a former U.S. Navy submarine and numerous other aircraft and military equipment. Of course, we can’t forget the golf — Magnolia Grove, an RTJ Trail attraction whose Crossings course was named one of the Top-50 Courses You Can Play by Golf World magazine, is just 13 miles away. Soak Up The Civil War History In February 1861, Jefferson Davis was sworn in as President of the Confederate States of America on the steps of the Alabama State Capital, in Montgomery. Today, visitors can tour that spot, along with the First White House of the Confederacy, and countless battlefields and museums that chronicle the state’s role in the American Civil War. Numerous sites offer full-scale re-enactments at certain times of the year, while others — like Mobile’s Bragg-Mitchell Mansion — give visitors a glimpse of Alabama in the antebellum era. Experience The Iron Bowl Auburn and Alabama have been playing football games against each other since 1893, making the Iron Bowl one of the oldest and most storied rivalries in all of college football. To experience the Iron Bowl, though, means far more than just watching a football game, no matter the stakes. Wander through the parking lots at Alabama’s Bryant-Denny Stadium or Auburn’s Jordan-Hare Stadium and inhale the aroma of barbecued ribs, grilled chicken fingers or fried fish (give a shout of “Roll Tide” or “War Eagle” and you’re likely to find a cold beverage and a mouth-watering piece of meat in your hand before long, the product of Southern hospitality). Listen to the marching bands rally the fans at the Tiger Walk or the Elephant Stomp. Then head inside and feel the emotion of tens of thousands of friends, family and neighbors cheering passionately for their teams. Best of all, if the game’s in Auburn — as it will be in 2017 — you’re just 15 minutes from Grand National Golf Club, the gem of the RTJ Trail. Entry: $200 Format: 36 Hole Stroke Play 3 Days of Golf In Gulf Shores, golfers can spend a day at the boardwalk (opposite), or a Civil War re-enactment at Fort Morgan (above). experiments and engage in other space-related activities at the world-famous Space Camp. Featuring day camps, week-long camps and even family programs, it’s an unforgettable way to learn about space in a hands-on environment. In addition to Space Camp, the Space and Rocket Center is also a museum for some of America’s most famous space memorabilia — see the Apollo 16 capsule that returned astronauts John Duke and Charles Young to Earth after their 1972 Moon mission, stare in awe at Saturn-, Mercury- and Jupiter-class rockets, or hop in a simulator to experience the 4Gs of liftoff or 2-3 seconds of weightlessness. While you’re there, visit Huntsville’s Hampton Cove Golf Club, featuring two courses with distinctly different designs, including the links-style Highlands course and the more classic River — the latter notable for being the only RTJ course in the world without a single bunker. Come join us for an exciting weekend! Fish for Marlin in Gulf Shores What the Iron Bowl is to college football, Gulf Shores and Orange Beach are to deep-sea fishing. Anglers travel from across the country Gulf Shores to fish for red and black snapper, king mackerel, grouper, tuna, marlin, swordfish and wahoo, along with the bluefish and flounder that stay closer to shore. Chartered cruises take anglers out on the Gulf of Mexico seven days a week for anywhere from a few hours to a few days, chasing down some of the most famous trophy fish on earth. And if you need to take a break from the waves, RTJ’s nearby Lakewood Golf Club, in Point Clear, has been named among America’s top golf resorts multiple times, while the Earl Stone-designed Peninsula Golf & Racquet Club in Gulf Shores proper is as fine a test as you’ll find in the state. n our business, we tend to focus on whatever’s new — new courses, new clubs, new players. “News” is the first word in the Cascade Golfer slogan, after all. Most of our most cherished golf memories, though, aren’t new at all. (If yours are, then your golf game must be in better shape than ours.) They’re times that we spent as a child learning the game alongside a parent, or times we spent with our own kids on the course when they were young. Our first birdie, our first eagle, and each time we broke a significant scoring margin for the first time. Hours spent watching Nicklaus, or Trevino, or a young Tiger Woods. Tom Watson sprinting across the green at Pebble Beach; Payne Stewart knocking down that 20-footer on the 72nd hole at Pinehurst. It important to remember that everything new will one day be old, and that being old doesn’t make a thing less significant — it just makes the memory of it that much sweeter. So, we tip our cap to a few of our state’s oldest courses. They’ve been giving golfers top value for their dollar for most of the last century — in fact, it’s a good bet that at least some of your favorite memories were made on these “golden” greens. Two Hours of Indoor Golf — Free! inding 5-6 hours of daylight in April to play a round of golf is tough, and even when we do manage to get a tee time on the calendar, we have to cross our fingers and hope for good weather. Not at Lynnwood’s Clubhouse Golf Center, though — golfers at the Clubhouse hit real balls with their own clubs on full-size simulators, playing courses like St. Andrews, Pebble Beach and others. Heck, not only can you play in the rain, you can even play after dark — most rounds take less than two hours, meaning you can hit the Clubhouse after work, or once the kids are in bed, and play a full 18 while watching the M’s on big screens and enjoying a cold beverage with your buddies. To make it even easier on you, we’re giving a CG reader two hours of simulator time on us — so log on to CascadeGolfer.com for your chance to win! There’s no public course in the state of Washington with a history to match that of Seattle’s Jefferson Park. The narrative begins in 1915, when Jefferson Park opened as the first municipally owned golf course in Seattle, and just the third golf course, period, in all of King County. The concept of municipal golf was so new, in fact, that locals simply assumed the “park” would be like any other in the city — that is, free to use. True to the populist Seattle spirit that our forebears have passed down through the decades, the concept of green fees was met with harsh criticism and public outcry. Horse-drawn mowers trimmed the fairways; goats kept the rough in shape. During World War I, the Army used Jefferson’s fairways as a runway, since there was no Seattle airport. When World War II came around, the Army returned, this time to build anti-aircraft batteries on one of the city’s highest points. In 1947, a local group of minority citizens founded the Fir State Golf Club for African-American golfers at Jefferson Park, the second-oldest organization of its kind in the U.S. (and one that would later count retired NBA legend Bill Russell as a member). A similar association for Chinese golfers soon followed, again among the first of its kind. Bill Wright, the first-ever black champion of a USGA event, honed his craft there. So, of course, did Fred Couples, hopping the fence to sneak in rounds as a teen. Even Tiger Woods put in an appearance, dazzling locals in a clinic as a 16-year-old junior in 1992. It’s a rich history, unmatched by almost any municipal course on the West Coast. And, true to the saying about “everything old,” Jefferson Park is now new again, having entered a new phase in its history last year with the opening of a brand-new, twin-deck, covered (and heated) driving range, an all-new practice area, plus a new clubhouse with a pro shop, restaurant and banquet facility. The next time you go back, try and locate the runways those planes might have used, the ideal spots for anti-aircraft batteries, or the exact spot in the fence where Couples and friends used to sneak through. Or, just tee it up and let it fly, and know that, like a century’s worth of golfers before you, you’re getting a great deal. LEAVENWORTH History is central to the experience of any Leavenworth visitor. The Bavarian-themed buildings, surrounded by jagged, Cascade peaks, evoke in every visitor the sense of not just traveling to a different place, but a different time, when communities were smaller, simpler and more at peace. Which, of course, is exactly what it’s intended to do. The “history” that we see when we visit Leavenworth, of course, isn’t its real history at all — spoiler alert: Leavenworth is not, in fact, located in the German Alps, nor was it founded by German immigrants looking to recreate their beloved homeland. Instead, the city began as a prime stop for fur traders making their way across Stevens Pass, before the logging boom sent the town skyrocketing in the early part of the 20th century. It was only in the 1960s when, the logging business having moved elsewhere, community leaders voted to transform the town into the tourist wonder it is today. It was at the tail end of the logging boom when a few local youths began knocking balls around the Chelan County racetrack, eventually pooling their resources to cobble together a three-hole golf course, with cinder greens that were conditioned not with mowers, but with mops. As the game caught on, they expanded to eight makeshift holes, reworked those into six good ones, then added three more in the late 1930s, converting the cinder greens to sand in the process. Just like the community itself, the course spent the better part of the next three decades keeping its head above water, before the influx of tourism money in the 1960s led to the construction of nine additional holes, finishing the layout golfers play today. Leavenworth can get lost sometimes among the bigname destination courses that draw golfers to Central Washington — Desert Canyon, Bear Mountain Ranch, Gamble Sands, Highlander and the like. But plunk down $25 on a weekday evening during your summer vacation, and imagine what it was like to pull a hickory wood and hit to cinder greens nearly a century ago. In a town as rich in history as Leavenworth, it’s not that hard to do. Online Tee Times and Web Specials Available at snoqualmiefallsgolf.com 425-441-8049 or 425-222-5244 Only good for 4 players with same day tee time. Not valid with any other offers or discounts. Good Monday - Thursday. Expires 5/31/16. It’s no secret that we owe many of the trails, campsites, mountain lodges and other elements of our “great outdoors” here in the Northwest to FDR’s Works Progress Administration, which put Americans to work during the Great Depression building parks, bridges and other civic works nationwide. What’s not as well known is that we can also credit the WPA for some of our oldest golf courses — including both West Seattle Golf Club and, in 1938, the golf course at Fort Lewis, now known as Eagles Pride. Golf had been proposed on the site as far back as 1917, when “Camp Lewis” was created to train soldiers for combat in World War I. At the time, though, military leaders felt golf was poor preparation for war, and instead sponsored sports like boxing and wrestling — I guess they’d never tried hoofing it through the mud and trees to find a wayward drive on a soggy January morning. In 1929, a group of eager soldiers carved out a ninehole track, before the WPA arrived in 1938 and built 18 brand-new holes — nine for officers, nine for enlisted men. All-day play was 50 cents — 75 if you needed to rent clubs. An officer-level membership, good for unlimited play, was $2 a month. In 1944, a Fort Lewis golf pro — Bob Hamilton — won the PGA Championship, in one of the greatest upsets in golf history. Both original courses still stand today — the officers’ nine is now Eagles Pride’s Red Course, while the enlisted nine is the Blue Course; a third nine, the Green Course, was built in 1979. The course opened to the general public in the 1990s (though military still receive preferred tee times) and has been a favorite of local golfers ever since — last year, our voting panel ranked Eagles Pride as one of the top-10 public courses in the “Seattle/Tacoma/Eastside” region; among the world’s military courses, it’s been ranked as high as No. 6. Stretched out to its longest distance — the 7,000-yard Red/Blue combination (the WPA’s original 18 holes) — it’s tough enough to host Washington State Amateurs and USGA qualifiers. We recommend any of the 6,300-yard routings, though — just enough to make you earn your good score, but not so much that a round of golf feels like basic training. n the nine years we’ve published Cascade Golfer, we’ve reviewed 565 different products, from seemingly every new driver, iron, putter and wedge to hit the market, to countless balls, bags, rangefinders, club carriers and other gizmos. Some, like Diablo Golf, which made its public debut in the pages of Cascade Golfer in 2010, have gone on to massive success — originally created by a couple of Cascade Golfer Cup players as a website to help them find other golfers to pair up with for friendly wagers at the local course, the Bellingham company’s smartphone app has evolved into the No. 1 handicap app in the world as determined by Apple’s App Store rankings. Others ... well, God bless ‘em, they tried. Here are some of our favorites. Of all of 565 products we’ve reviewed, this is the only one that I take with me every single round I play. Sure, it’s basically just a tube of plastic with a handle and spikes in the bottom, and if you’re especially handy, you can probably make one yourself. But I use it all the time when I need to grab a few clubs because I’m not sure of a distance, or when I need a wedge and putter at the green. It makes the clubs easy to carry, keeps my shafts dry, and ensures I won’t leave a stick behind. I’ll admit, this one is in here mostly because of my favorite headline ever written in CG (and one I can’t even take credit for): “One Shirt To Rule Them All.” Ionic bracelets had taken off by 2011; this Energy Athletic shirt used negatively charged ions to increase blood flow to the wearer’s muscles, for increased flexibility, strength and quicker recovery. We were skeptical until reading the studies, and an endorsement by Paul Azinger, who swore by the “magic shirt” and wished it had been around in ‘08, when he was captain of the Ryder Cup team. Five years later, the company is still going strong, probably as much evidence as any that the shirt really works. In our June 2008 issue, we dedicated the “In The Bag” section to reviewing some of the wild products that show up on those Golf Channel infomercials. One of the most fascinating was the Adams Golf DiXX BLU putter, a putter with a computer in the clubhead. The computer measured your swing path and club face angle, then displayed that information on a LCD screen in the clubhead. Golfers could use it as a training aid, then switch to a USGA-approved playing module to take it out on the course. They’re not in stores any longer, but you can still find them online — if anyone has or owned one, let us know. This was another of our favorites, mostly for the picture (above) — that’s one rad-lookin’ dude. The local inventor wished he could ride his Harley to the course. So, he invented a golf bag that could be ingeniously split into three sections and attached to his chopper (for equal weight distribution), then quickly snapped back together at the course to go right to the first tee. It’s disappointing to see that the website is no longer active, but we’d love to hear from anyone who bought — and loves — their Bike n’ Golf. Who can forget the putter that came with a mirror and level? I remember my first time seeing the putter at Jackson Park and thinking, What is that thing? The locally invented Prodigy had a detachable mirror and level which helped golfers learn to find and maintain the correct line; remove it, and you had a USGA-conforming mallet putter. It also had adjustable weights and a flexible shaft so golfers could fit it to their swing — in all, it was a cool product, which is why we were bummed to discover that it’s no longer on the market. It’s still one of our favorites. We’re Sending YOU to Palouse Ridge!